A mysterious X-ray source discovered in Chandra Deep Field-South data, giving the deepest X-ray image ever made, became 1,000 times brighter over a few hours before fading dramatically in about a day. Hubble and Spitzer data indicate this source is likely located in a small galaxy about 10.7 billion light years from Earth. Evidence points to this being some sort of destructive event but perhaps unlike any ever seen before. Scientists have discovered a mysterious flash of X-rays using NASA's Chandra X-ray Observatory, in the deepest X-ray image ever obtained, as reported in our latest press release. The X-ray source is located in a region of the sky known as the Chandra Deep Field-South (CDF-S), which is shown in the main panel of this graphic. Over the 17 years Chandra has been operating, the telescope has observed this field many times, resulting in a total exposure time of 7 million seconds, equal to two and a half months. 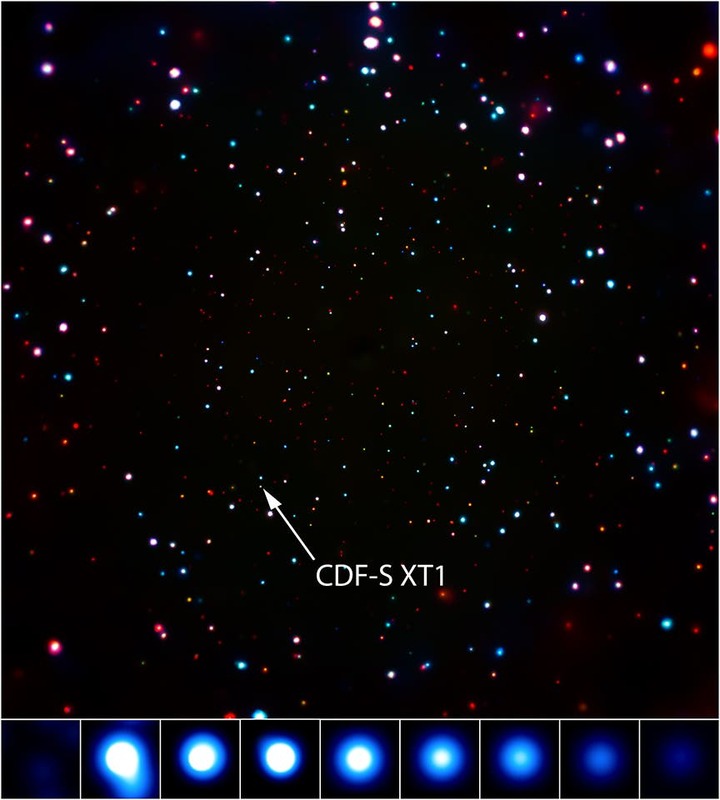 In this CDF-S image, the colors represent different bands of X-ray energy, where red, green, and blue show the low, medium, and high-energy X-rays that Chandra can detect. The mysterious source that scientists discovered, shown in the inset box, has remarkable properties. Prior to October 2014, this source was not detected in X-rays, but then it erupted and became at least a factor of 1,000 brighter in a few hours. After about a day, the source had faded completely below the sensitivity of Chandra. While scientists think this source likely comes from some sort of destructive event, its properties do not match any known phenomenon. This means this source may be of a variety that scientists have never seen before. The researchers do, however, have some ideas of what this source could be. Two of the three main possibilities to explain the X-ray source invoke gamma-ray burst (GRB) events, which are jetted explosions triggered either by the collapse of a massive star or by the merger of a neutron star with another neutron star or a black hole. If the jet is pointing towards the Earth, a burst of gamma-rays is detected. As the jet expands, it loses energy and produces weaker, more isotropic radiation at X-ray and other wavelengths. The mysterious X-ray source was not seen at any other time during the two and a half months of exposure time Chandra has observed the CDF-S region. Moreover, no similar events have yet been found in Chandra observations of other parts of the sky. This X-ray source in the CDF-S has different properties from the as yet unexplained variable X-ray sources discovered in the elliptical galaxies NGC 5128 and NGC 4636 by Jimmy Irwin and collaborators. 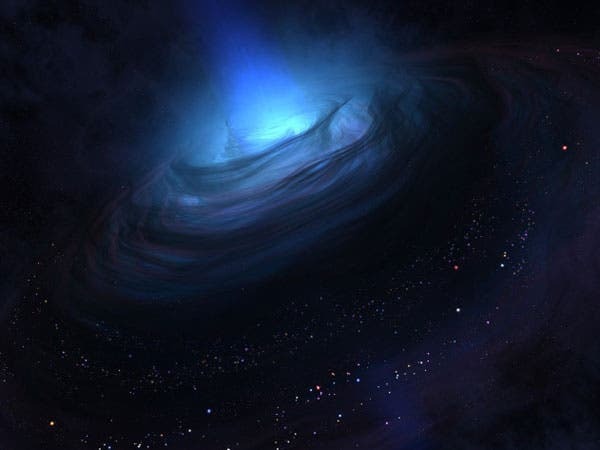 In particular, the CDF-S source is likely associated with the complete destruction of a neutron star or white dwarf, and is roughly 100,000 times more luminous in X-rays. It is also located in a much smaller and younger host galaxy, and is only detected during a single, several-hour burst. Additional highly targeted searches through the Chandra archive and those of ESA's XMM-Newton and NASA's Swift satellite may uncover more examples of this type of variable object that have until now gone unnoticed. Future X-ray observations by Chandra and other X-ray telescopes may also reveal the same phenomenon from other objects. A paper describing this result appears in the June 2017 issue of the Monthly Notices of the Royal Astronomical Society and is available online. NASA's Marshall Space Flight Center in Huntsville, Alabama, manages the Chandra program for NASA's Science Mission Directorate in Washington. The Smithsonian Astrophysical Observatory in Cambridge, Massachusetts, controls Chandra's science and flight operations.